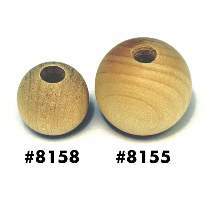 These birch balls are drilled part way to accommodate a 1/4" dowel. Perfect for holly berries on several of our Christmas projects. To attach pre-drilled ball, cut 1" length from 1/4" dowel pin stock, apply glue and use dowel to attach ball.